Adam Heller, Julia Knitel, and Cheryl Stern in A Letter To Harvey Milk. BOTTOM LINE: A new musical that connects the life of Harvey Milk to that of a recent widower powerfully gains momentum in both theatrical brilliance and emotional impact. Isn’t it ironic how people with whom we seemingly have nothing in common can end up bearing similarities to ourselves that are too significant to be ignored? The new musical A Letter To Harvey Milk explores this phenomenon, bridging the stories of two men with outwardly polar opposite lives. A small yet mighty ensemble of musicians sits along a walkway above a modest façade of a townhouse that is true to the San Francisco setting. As the overture begins, we are met with silent, slightly eerie slow-motion vignettes illustrating moments in the lives of two men, one of whom is clearly Harvey Milk (Michael Bartoli). At the overture’s conclusion, we meet our protagonist Harry Weinberg (Adam Heller), and, without ruining a truly magical theatrical moment, his recently departed wife Frannie (Cheryl Stern). As the two sing about their lives together, it becomes clear that Harry is having a hard time letting go. Harry attempts to put his grief aside by joining a writing class, led by the young teacher Barbara Katsef (Julia Knitel). Knitel’s vocal prowess is immediately recognizable, and she brings an undeniable likeability and dorky charm to her role. For one of Barbara's writing assignments, Harry must write a letter to someone who has died. And—no surprise—Harry chooses Harvey Milk, who he actually knew, having done business with him in the shop he owned with his wife. As Harry and Barbara become close friends, a sort of father-daughter relationship is established, and he continues to open up to her about his friendship with Harvey—much to the chagrin of the “ghost” of Harry’s wife, who continues to provide comedic relief. Stern is especially hilarious in "What a Shanda," evoking her and her husband’s Jewish roots to explain how much of a loss it is that such a smart, caring, and beautiful woman like Barbara is a lesbian. But the musical really takes off in its second half. Impressed by Harry’s titular letter to Harvey Milk, Barbara goes behind his back and submits it for publication in a well-established magazine. This betrayal, combined with Barbara’s own personal trials and tribulations as a young lesbian, gives the production a dramatic upswing that lands much more true than its first half. Without spoiling the big reveal, the show crescendos in the revelation that Harry and Harvey were both persecuted for being who they were. Overall A Letter to Harvey Milk is impressive and quite enjoyable, but could use further revision (it originally premiered at the New York Musical Theatre Festival in 2012). The musical is nearly sung-through, and while some songs feel necessary to move the piece along, others are less so, and perhaps would work better as spoken dialogue. And while some of the numbers have lyrics that are quite poetic and beautiful, others are a bit on the nose. 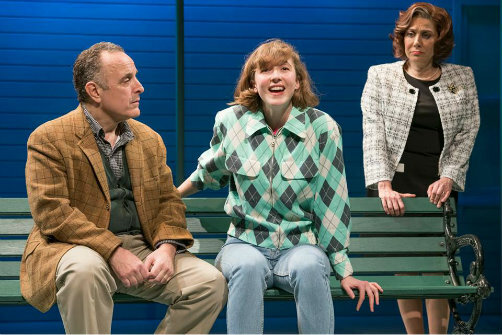 If it weren’t for the unexpectedly poignant turn the production takes in the second half, A Letter To Harvey Milk might be somewhat forgettable. But for theatregoers interested in taking a look at the fallout of Harvey Milk’s death, I would definitely recommend giving this production a go. A Letter To Harvey Milk is by Jerry James, Ellen M. Schwartz, Cheryl Stern, and Laura L. Kramer, based on a short story by Leslea Newman. Directed by Evan Pappas. Set Design by David Arsenault. Lighting Design by Christopher Akerlind. Sound Design by David Margolin Lawson. Stage Manager is Sara Sahin. The cast is Adam Heller, Cheryl Stern, Julia Knitel, Michael Bartoli, Jeremy Greenbaum, CJ Pawlikowski, and Aury Krebs.